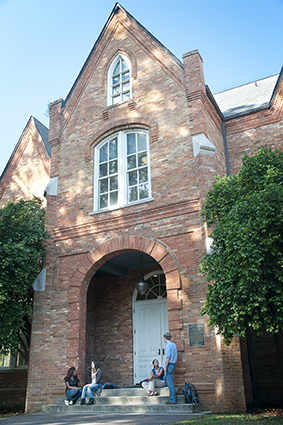 Students in the Blount Undergraduate Initiative take small, seminar-style classes and have academic homes in Tuomey and Oliver-Barnard halls. It’s a weighty question. What was the most important thing you did while you were in college? For a small group of students in UA’s College of Arts and Sciences, the answer is often instantaneous and simple: The Blount Undergraduate Initiative. Although the four-year liberal arts program comprises a mere 20 percent of each participating student’s course of study, giving each student a minor in the liberal arts, Director Joe Hornsby said he hears the same message from graduating seniors each year. That is, the Blount Initiative was the single most important part of their collegiate careers. Michelle Fuentes, a 2007 graduate of the program who received her doctorate in political science from UA this year, is no exception. “Blount has been the most transformative organization I’ve ever participated in,” she said. The program, which boasts one of the strongest 10-year reviews on record, is celebrating its 15th anniversary this year with an on-campus commemoration Oct. 31-Nov. 1. All alumni, faculty, and staff who have participated in the program are invited to attend. The Blount Undergraduate Initiative was established in 1999 as an intellectual and social haven for exceptional students interested in the liberal arts. Its students take small, seminar-style classes from professors throughout the College of Arts and Sciences faculty, starting and ending with courses that bring into conversation the ideas of some of the world’s greatest thinkers, including Plato, Sigmund Freud, John Stuart Mill, Karl Marx, Edward O. Wilson, and Steven Pinker, to name a few. Extensive reading and writing are standard from day one. The program began with then Dean James Yarbrough’s vision to create a college experience much like he and many other faculty members had experienced themselves, one in which the residence hall was an important part of a student’s life and intellectual growth. Today, the Blount Living-Learning Center embodies that vision. All freshmen in the program live and take classes in the center their freshman year, while upperclassmen have academic “homes” in the heart of campus in Oliver-Barnard and Tuomey halls, located on the main Quadrangle. The program is named in honor of Winton and Carolyn Blount, who gave $7 million to the College to endow and establish the initiative. Fuentes, though emblematic of other Blount students in her passion for the program, has a particularly unique relationship with it. She participated in Blount as an undergraduate, co-taught freshman seminars as a graduate student, and served six classes of students as the director of the living-learning center. But students aren’t the only ones who say the program is influential. Dr. Sally Davis, who served on the faculty committee that helped create the program, retired in 2005 from teaching in the Department of English. But she still teaches Blount courses because she said they allow her to continue the parts of academic life she enjoys most. “I like the material, the interaction with faculty in other departments, and the students,” Davis said. “One of the nice things, almost from the program’s beginning, we heard and still hear is that other faculty members say they can tell when they have a Blount student in their class, which I like. The students talk and participate more, and they think better and write better. Dr. Ian Brown, who served on the faculty committee with Davis and currently serves as chair of the Department of Anthropology, feels similarly. The College of Arts and Sciences will be hosting a day of activities for all former and current Blount scholars in Oliver-Bernard Hall on Nov. 1. Any current or former students who signed Blount’s “Book of Scholars” as freshmen are invited, as are any faculty or administrators linked to the program throughout its history. From 11 a.m. to 2 p.m., there will be an informal open house in Oliver-Barnard Hall for participants to mingle and discuss the program, as well as showcase the program to prospective students. A cocktail reception will be held for participants only at 6 p.m.
For more information, visit as.ua.edu or call the Blount Undergraduate Initiative office at 205-348-1706.